When Rick tells Ilsa that the problems of three little people don’t amount to a hill of beans in this crazy world and that she must get on that plane the audience holds its collective breath. Will she stay in Casablanca or join her husband to fight the good fight? It’s a suspenseful few moments; this romantic struggle. To this day, my stomach clenches with anxiety; will she really get on that tiny prop plane during such a thick fog? 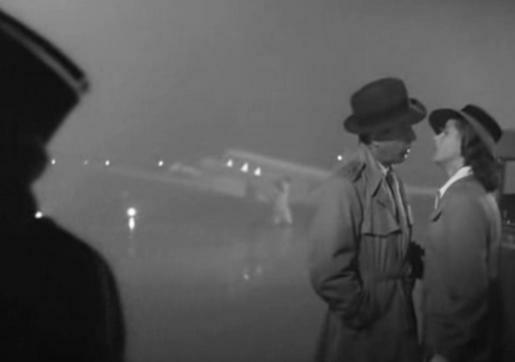 For me any follow-up film wouldn’t answer romantic questions but instead whether Victor, Ilsa and the pilot got there in one piece. Ordinarily travel in film was depicted (and often actually was) kind of glamorous. There was a (relatively) brief period of time during which air travel was regularly available and pricey. People dressed, not to teach yoga, but to travel. There was such a thing as ‘travel outfits’ that did not include a u-shaped pillow (presumably for the neck but identical to a hemorrhoid pillow.) We can all agree those days are over. But what has taken its place? Slowly but surely you can (or will be able to) buy or finagle your way into civility. There are ways to avoid the TSA hall of mirrors screening. Cavity searches and arbitrary confiscations can be bypassed with elite registration. You needn’t wait at the gate/Ellis Island Great Hall if you pay for V.I.P. status with an airline. You can eat cubed cheese behind closed doors, for a price. Passengers can pre-board as V.I.P.s as well. Pre-board? Why would anyone care to sit in a can longer than necessary? Well, claiming space in an overhead bins is a sweet (and at times elusive) victory. Airlines now charge passengers for the opportunity to have one’s luggage damaged, stolen or lost. Those bins fill up fast and with items you wouldn’t think could fit through the aircraft door let alone a bin. So if you’ve paid your additional memberships and registered accordingly, you have gotten onto the airplane in a civilized manner. You’ve still carried your bag like a sherpa and purchased your own magazines, newspapers and meals. But you haven’t stood on endless lines or worse, in large unwieldy clusters. You’ve not been checked for scurvy or glaucoma or had your name changed. No, you and your burlap sack of boiled potatoes and sausage are seated comfortably with your worldly possessions within eyeshot. You are seated comfortably, aren’t you? Okay forget about your legs for a moment; you’re okay right? What’s that? You’ve no sensation in your shins? No, I’m sorry those seats (with extra legroom) in the emergency row cost extra. That’s right you get to pay for the privilege of agreeing to assist 150 people out of a crashed airplane. Now just sit back and try to relax. Here, have some recycled air. Your air blower doesn’t work? Let me see if I can flag an attendant to help you. Hmm, all I seem to see is people wearing jeans and bright pink tops. There seems to be a woman in an electric pink housedress maybe she can help. It would appear that this Delta flight is not only cross-listed with Alaska Air, KLM, Bob’s Plane, but with Barbie Air as well. (*Note-flights are now cross-listed like college courses. Don’t ask why; don’t even think too much about it, just check and re-check which terminal has your plane.) Wait it seems it’s not Barbie Air. No, it’s a charity campaign. Yep! If you act now not only do you enjoy the posh pleasures of flying in a can, providing your own meals, entertainment, and blankie, you have the opportunity to donate to the charity of your airline’s choice! No doubt the airline is looking for some good will. You know what might create some good will? Have the attendants wear uniforms. Don’t have the pilot stand in his shirt sleeves (and white plastic sunglasses) showing the attendants photos of his wild antics last night as passengers are boarding. Be on time and be nice. Stop making the seats smaller and closer together. In fact; stop making the seats. There should be two classes; first class (for which a ticket is never less than $5,000 each way) and upright. Yes, upright. Just straps us in like parachuters. You could fit a lot more people in that way and eliminate the need for any bathrooms! Flying is already like riding the subway in so many other ways; I say take that last brave step for mankind. Nothing will create goodwill faster than just getting me there in one piece after such a harrowing experience. I’m willing to wager that Ilsa and the pilot of that prop plane are probably the ones that lived happily ever after.